Bar Harbor is a town on Mount Desert Island in Hancock County, Maine, United States. Visiting Acadia National Park and Gorham Mountain Trail will get you outdoors. The adventure continues: head off the coast to Mount Desert Island, see the interesting displays at The Seal Cove Auto Museum, take in the awesome beauty at Cadillac Mountain, and tour the pleasant surroundings at Carriage Roads. To find where to stay, reviews, more things to do, and other tourist information, go to the Bar Harbor trip itinerary site . Eugene to Bar Harbor is an approximately 14-hour flight. You can also do a combination of bus and flight; or drive. The time zone changes from Pacific Standard Time (PST) to Eastern Standard Time (EST), which is usually a 3 hour difference. Expect a bit cooler weather when traveling from Eugene in September: highs in Bar Harbor hover around 70°F, while lows dip to 52°F. Cap off your sightseeing on the 20th (Fri) early enough to go by car to Ogunquit. Start off your visit on the 21st (Sat): explore and take pictures at Mount Agamenticus, head outdoors with Fisherman's Walk, then admire all the interesting features of Perkins Cove, and finally appreciate the extensive heritage of Marginal Way Walkway. For traveler tips, other places to visit, ratings, and other tourist information, use the Ogunquit trip planner . Traveling by car from Bar Harbor to Ogunquit takes 4 hours. Alternatively, you can do a combination of flight and bus; or do a combination of car, flight, and bus. 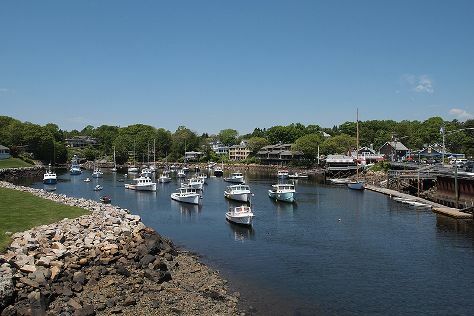 In September, daily temperatures in Ogunquit can reach 74°F, while at night they dip to 48°F. Wrap up your sightseeing on the 21st (Sat) to allow time to drive to New York City. Satisfy your inner culture vulture at The Metropolitan Museum of Art and The Museum of Modern Art (MoMA). Museum-lovers will appreciate 9/11 Memorial and American Museum of Natural History. The adventure continues: take in the pleasant sights at Central Park, make a trip to Times Square, take in the architecture and atmosphere at St. Patrick's Cathedral, and contemplate the long history of Ellis Island. To see traveler tips, other places to visit, where to stay, and more tourist information, you can read our New York City trip itinerary builder website . You can drive from Ogunquit to New York City in 5.5 hours. Alternatively, you can take a bus; or take a bus. Expect somewhat warmer temperatures when traveling from Ogunquit in September; daily highs in New York City reach 80°F and lows reach 66°F. Wrap up your sightseeing on the 25th (Wed) to allow time to drive to Gettysburg. On the 26th (Thu), take an in-depth tour of Gettysburg National Military Park Museum & Visitor Center, witness the site of a historic battle at Gettysburg National Military Park, then explore the different monuments and memorials at Gettysburg National Cemetery, and finally admire all the interesting features of Confederate Trails of Gettysburg. Get ready for a full day of sightseeing on the next day: take in the dramatic natural features at Devils Den, then steep yourself in history at Little Round Top, and then hike along Cumberland Valley Rail Trail. To see ratings, photos, traveler tips, and other tourist information, read Gettysburg route maker . Traveling by car from New York City to Gettysburg takes 4 hours. Alternatively, you can take a bus; or do a combination of train and bus. Traveling from New York City in September, plan for slightly colder nights in Gettysburg, with lows around 57°F. Wrap up your sightseeing on the 27th (Fri) to allow time to drive to Philadelphia. Get outdoors at Valley Forge National Historical Park and Independence National Historical Park. Independence Hall and Christ Church will appeal to history buffs. There's lots more to do: tour the pleasant surroundings at Schuylkill River Trail, explore the world behind art at Philadelphia Museum of Art, get engrossed in the history at Eastern State Penitentiary, and trek along Kelly Drive. To find where to stay, maps, reviews, and more tourist information, use the Philadelphia trip planner . You can drive from Gettysburg to Philadelphia in 2.5 hours. Other options are to do a combination of taxi, flight, and train; or do a combination of bus and train. Expect somewhat warmer evenings in Philadelphia when traveling from Gettysburg in September, with lows around 63°F. Wrap up your sightseeing on the 30th (Mon) to allow time to travel back home.